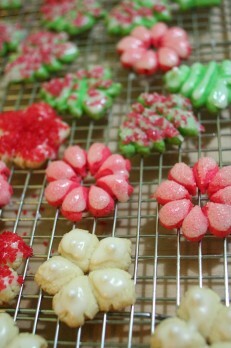 This year I made almond spritz cookies for Christmas. I’ve always wanted to use a cookie press. Up until a few years ago, we had spritz cookie ornaments that my Mom had preserved with some sort of varnish. Sadly, after over twenty years of use they started to crumble and had to be thrown away. But I’ll never forget that every year when we decorated the tree I hoped I’d unwrap one to put on the tree, I thought they were just so beautiful. I assumed the cookies would be really simple to make, the recipe (which I modified to include almond extract rather than vanilla extract for both the dough and frosting) was straightforward and didn’t call for any chilling or unique ingredients, and the cookie press would just shoot out the cookies quickly. I waited until 8pm the night before our now annual cookie exchange to make them. Well let me tell you it was not that simple. Martha neglected to tell me that the dough should be chilled and that the butter should be at room temperature and that the cookie sheets should be put in the freezer before pressing the cookies out. Thank goodness for online forums or else I might have disowned Martha. I’m still mad at her because she forgot to mention that my hand would go numb from all the pressing and that her dough would snap the Christmas tree disc. Anyways they turned out beautiful and delicious but I’m not sure the next time I’m going to whip out the press, but I am sure that it won’t be with one of her recipes. p.s. 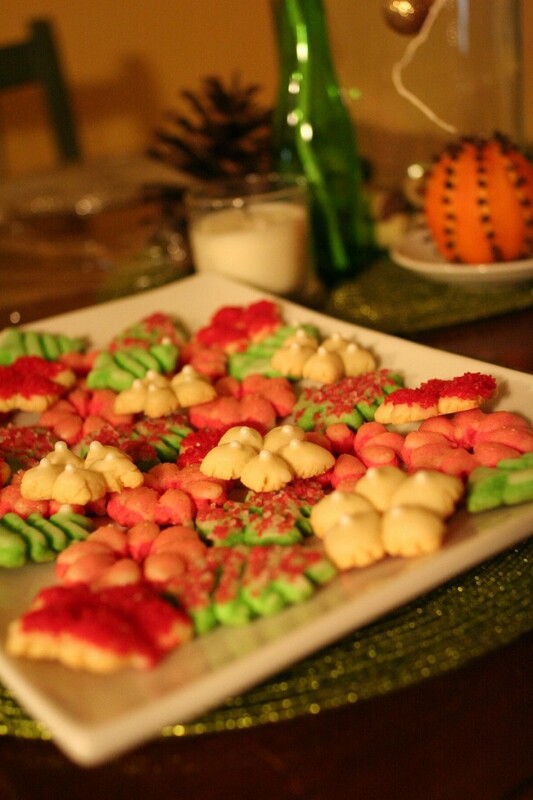 i probably ate over thirty, okay forty, of these cookies over the holidays. yum!